South Shore condominiums in Jacksonville Beach, Florida. 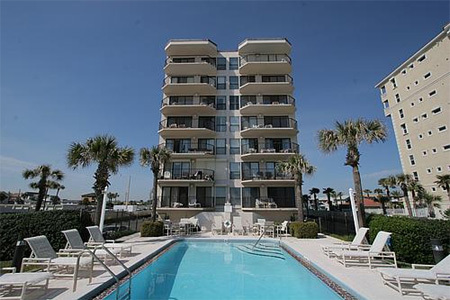 Southshore is an oceanfront condominium in Jacksonville Beach. Built in 1984, Southshore offers costal living with breathtaking ocean views of Atlantic Ocean. Southshore features open floorplans with an abundance of natural light from 60 feet of windows and patio doors. Each residence has three bedrooms, two baths, two balconies, covered parking and additional guest parking. Amenities include oceanfront pool, secured building with elevators, exterior pest control and garbage pickup. Enjoy the beach lifestyle of fun, sun, ocean breezes, and the sound of crashing waves. Jacksonville Beach offers the best of Florida living with miles of white sandy beaches and mild seasonal changes. Three expressways provide easy access to Jacksonville for business, shopping and entertainment. Friendly, laid-back lifestyle where standard attire is shorts, sandals and a smile. Semi-tropical climate with breezy summers, pleasant winters, perfect springs and falls.